The last few Feel Good Fridays have focused on work being done by adults so today we shine the spotlight on some kids - the Burrito Boyz from Hunger 2 Help. 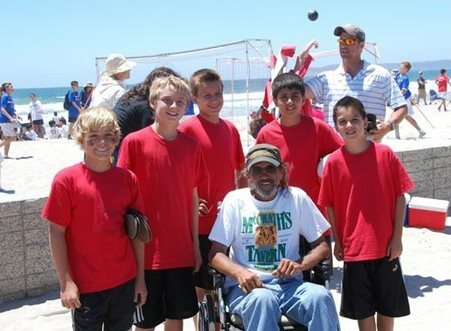 This group in San Diego, California began in November, 2010 after Michael and Mehrnaz Johnson got their son Alec's very long list of items he wanted for Christmas and decided to give him some much needed perspective. As stated on their website, "Not only were they hoping to teach their son and his friends not to take things for granted, they wanted to DO something to help others. After just their first Sunday downtown serving 54 hot breakfast burritos and bottles of water, the group knew they had started something special." There are now 7 burrito boyz and a Girl Scout troupe that make and serve burritos to the homeless every Sunday - so far that's 149 Sundays and over 40,000 meals! Their mission is to help nourish the spirit of the street homeless of San Diego by providing hot food and comfort. Well, FGF says, mission accomplished! To learn more, you can watch a video from CBS news on their website or like their Facebook page. As for me, I'm off to find a breakfast burrito. Mmmm, burrito.